Eventually it stopped raining in Rio and we’ve managed to go up to Carcovado to see the statue of the Cristo Redentor. It was actually smaller than what we expected but the view over Rio was spectacular. The best thing about Rio for me was … the running path along the Copacabana beach with distance markers every 400m – excellent training spot. 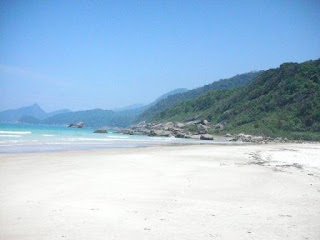 After leaving Rio we took the public bus to Angra dos Reis and the boat to Ilha Grande. The island is like a small hidden paradise with no traffic (there is only one car on the island which belongs to the military police) and no busy roads – such a difference from Rio. The 5 days on the island passed very quickly with our favourite activities being the daily morning run and an evening swim and the rest of the day spent lazying around in our hammocks at the hotel drinking beer and reading. On Monday we did a 5 hour round trip trek across the mountains through the rainforest to what is claimed to be the most beautiful beach in Brazil – Praia Lopez Mendez – quite spectacular. Now we’re off to the small town of Parati and then to the urban jungle of Sao Paulo. Glad to hear all is going well and your having a great time. that island looks great! Just thought I'd let you know the soloist is wrapped up in my loft now for winter.